Scooby dooby doo, where are you? Evidently, in the LEGO aisle of your local toy store. LEGO, via USA Today, has just announced five upcoming LEGO sets, set in the long-running Scooby-Doo universe. We've only been given a glimpse at one of the sets so far (which you can see to the right), but I'm happy to report that there is no sign of Scrappy Doo, the puppy everyone loves to hate, as of yet. 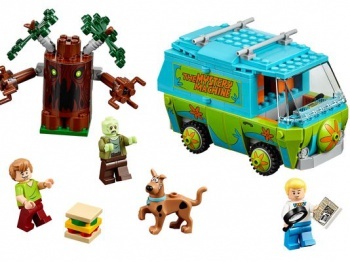 What it does feature is the iconic Mystery Machine van, as well as Scooby, Shaggy and Fred mini-figures. There's also a "zombie" mini-figure, whose head will most likely pop off to reveal it was Mr. Jenkins from the museum the whole time! "Fans always wonder which properties may come to life in LEGO form, and this year we are thrilled to bring all of the mystery, humor and hijinks of the Scooby-Doo universe to life in LEGO toys and animated content," said Jill Wilfert, vice president, licensing & entertainment at The LEGO Group. As well as the Mystery Machine set, we know that three of the other four remaining sets will be the Mummy Museum Mystery, The Haunted Lighthouse and The Mystery Mansion, and that each set will retail between $14.99 to $89.99. We've been told that these sets will draw from Scooby-Doo lore that dates back to its conception in 1969, so hopefully, hopefully, they will continue to skim over addition of Scooby's annoying nephew. The sets will be available in August, 2015.